For the second time in the tournament, the most influential figure in a Brazil game was the referee. In this encounter, the tale had a twist at the end. This was not a game in which formations played a significant role. Colombia lined up in an expected 4-2-3-1, with Víctor Ibarbo returning to the left wing role he had played in their opening two group games and Fredy Guarín replacing Abel Aguilar in the more advanced of the holding midfield roles. Guarín was an offensive-minded substitution (Alexander Mejía being José Pékerman’s usual late-game replacement for Aguilar), suggesting that Colombia came to play. At halftime, Adrián Ramos (the Hertha Berlin striker recently signed by Borussia Dortmund to replace Robert Lewandowski) replaced the relatively listless Ibarbo on the left, signaling a further attacking intent. After Brazil’s second goal, Carlos Bacca replaced Teófilo Gutiérrez and played just underneath Ramos in a 4-4-2 with Juan Cuadrado shifting to the left wing and James Rodríguez out right. Colombia was most effective in this final portion of the game, but Brazil’s decision to bunker in may have had as much to do with that fluency as the new formation. 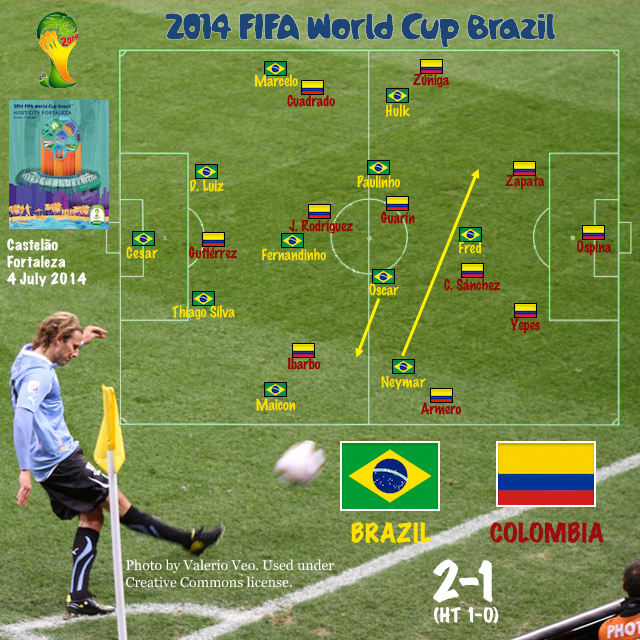 Though listed as a 4-2-3-1 in most outlets, Brazil was functionally a 4-3-3 throughout the game, with Paulinho–always a shuttling midfielder–playing alongside and in many cases in advance of Oscar in the middle. Hulk was left and Neymar right, though Neymar was constantly inside and right back Maicon, replacing Dani Alves, provided the actual attacking width on that flank. For much of the second half, Neymar was effectively playing to the left of Fred (if not in advance of him) with Oscar loosely covering his position on the left. Whether this was an actual shift to a 4-4-2 or simply Neymar’s license to roam isn’t entirely clear. Brazil didn’t make a substitution until the 83rd minute, and each of them created a more defensive set-up, though by that stage of the game they looked an 8-2 regardless of personnel. Carlos Velasco Carballo (Esp) – Though probably more damaging to the tournament as a whole, Carballo’s performance was objectively far more consistent than Yuichi Nishimura’s in the opening game. Carballo was consistently lenient towards both teams until about the 60′, when even he seemed to realize that things could not continue as they had. The 54 fouls committed in this game, 41 of them before the first yellow card was issued, is the most in any game this tournament–and that’s despite a sense that Carballo was lenient in awarding fouls as well as cards. Neither team was happy with Carballo’s performance, but conspiracy theories about favoring one team or the other seem off the mark. Though Carballo’s leniency undoubtedly created the state of play in which Neymar was injured, this was hardly a predictable outcome. Colombian fans, in fact, can rightly point out that, focusing solely on this game, Brazil gained much more from Carballo’s leniency than did Colombia. They committed more fouls, and probably got away with more as well. Moreover, Brazil was the team one would have expected to benefit from a lenient referee. As Jonathan Wilson noted in his fine short piece on the game, the second-most fouls in a game this World Cup (51, though only 35 of them before extra time) came in Brazil’s previous game against Chile, with Brazil again the principle aggressor (Wilson also notes that rotating defenders to allow for tactical fouling has been a part of Brazil’s strategy throughout the tournament). If one were to embrace a conspiracy theory, the more likely one is that this was an effort to favor the host nation gone awry. In reality, Carballo’s performance is simply the unintended consequence of FIFA’s desire to avoid semifinal suspensions meeting Luiz Felipe Scolari’s anticipation of and pragmatic response to that policy. As noted by the Independent, the four referees selected for the quarterfinals had issued on average 0.5 fewer yellow cards per game than the tournament average. FIFA’s goal was probably just to keep as many stars as possible; in that regard, it could be argued that Scolari’s violent game plan was as much at fault as Carballo for the game’s violence. But just as much as managers, referees must to adapt their performance to the nature of the game at hand. While Carballo was undoubtedly faced with a daunting task given Brazil’s approach to the game, he quite clearly failed to keep it under control. Anyone who has played football is aware of the relationship between fouls suffered–especially when thought to be insufficiently acknowledged by the referee–and retaliatory fouling. Is anyone surprised that Cuadrado, having just been fouled for an offense that he believed warranted a card, body tackled Neymar in the 63′ to break up a play? Is there any chance that the other players failed to note that Cuadrado, too, escaped a booking? At this point in the game, Carballo had still not produced a single yellow card. He would not do so for a violent action for another four minutes (Thiago Silva’s 64′ card was for interfering with the goaltender’s kick). Quite simply, Carballo waited until too late to effectively rein in the game. Because of the general nature of Carballo’s performance, focusing narrowly on Juan Zúñiga’s 86′ foul on Neymar misses the point. As Jonathan Wilson notes, rightly in my view, “In the context of a robust game, the incident that led to the injury didn’t seem particularly noteworthy.” But stepping back, one notes that Zúñiga was one of the most fouled players in the game, behind only his teammates James Rodíguez and Juan Cuadrado, and ahead of Neymar. Even more troubling, given the later event, was the missed opportunity in Zúñiga’s 45′ foul on Hulk. Attempting to stop the striker from initiating a counter-attack, Zúñiga raked his studs across Hulk’s knee, a foul that was much more clearly pre-meditated and–statistically speaking–a much more dangerous play than the one in which Neymar was injured. It was undeniably a yellow card offense, and had Zúñiga received a red he would have had little room for complaint. Had Carballo chosen to clamp down near the end of the first half, as he quite clearly should have, it seems likely that the tone of the second would have been considerably altered. The idea that he could still be the favorite to referee the final, as is being reported by the Daily Mail, is frankly shocking if true. James Rodríguez (Col) – The Belle of the Ball has been kicked out of the World Cup–quite literally, in this case. While Neymar may have been the most fouled player in the tournament as a whole, it’s difficult to think of any contest in which a player was more marked for physical handling than Fernandinho’s treatment of Rodríguez in this game. Rodríguez suffered six fouls in the game (those were just the ones acknowledged by Carballo). By comparison Charles Aránguiz did not commit a single foul in marking Xabi Alonso out of Chile’s victory against Spain, nor did Celso Borges in his marking of Andrea Pirlo in Costa Rica’s defeat of Italy, though Pirlo did suffer three fouls committed by others. Man marking need not involve the brutality used by Fernandinho, and we are all the poorer for Rodríguez’s departure from the World Cup. Hulk (Bra) – For the second straight game, Hulk was Brazil’s most impressive offensive performer, with great chances at 20′ and 28′. With Neymar now out of the tournament, Scolari had best recognize this fact and set out his side in order to maximize his most important striker’s performance. Though Willian left training with an injury two days ago, he seems certain to replace Neymar in Brazil’s starting line-up (the pacey but less influential winger Bernard and Ramires are the other options). Bayern Munich’s Dante will come in for the suspended Thiago Silva, and Luiz Gustavo will return to a holding role, probably alongside the more defensive Fernandinho (as opposed to Paulinho). The more interesting question is whether Scolari will further shake up his line-up in order to counter Germany or to maximize his own team’s strengths, such as they are. As I suggested above, getting the most out of Hulk seems critical to Brazil’s success. At a minimum, this probably means returning him to the right flank which is his most natural position. But given the poor performance of Fred thus far and the need to counter Germany’s midfield, it might make more sense to push Hulk up into the primary striker’s role, allowing Paulinho to play in between Willian (joining the attack a la Neymar) and Oscar (moving inside for further midfield support). Scolari seems unlikely to adopt this more radical tactic from the outset, but an early substitution for Fred might make way for something more along these lines if Brazil is still needs to score.